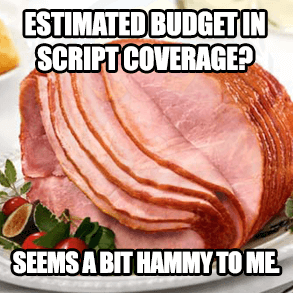 Have you ever received a coverage back from a company or private script reader and the coverage has a “budget” section? The answer is fairly simple, and comes in two parts. The first reason is that development executives at studios and production companies sometimes actually know what they’re talking about, and can accurately estimate a spec script’s budget and market viability. The second reason is because of your grandma’s ham. Let me explain. And pardon if you’ve heard this urban legend/aphorism previously. You’re at your mother’s. She’s preparing a Thanksgiving ham. She puts it on a cutting board and chops off both ends of the ham, then sticks it in the oven. The dubiously connected moral of the story being: In many cases, nobody knows why they include Budget and Marketability in script coverage. It’s just because their forefathers did it. Yet the ultimate sticker price of developing, prepping, producing, finishing, and marketing a motion picture, as well as the picture’s general viability in the fractious, ever-shifting modern film marketplace, are mysteries that usually lie far beyond the ken of most script readers providing script coverage. Most script readers have absolutely no experience breaking down a film, lining and scheduling a film, let alone budgeting one. Yet there it is on many script coverage forms: Budget. Most people working in the film industry in general have absolutely no idea what makes a film marketable. (Note, I said “most,” not “all.” Because some actually do.) The vast majority of Hollywood, however, always seems to be “chasing where lightning just struck.” i.e. trying to emulate whatever big dumb film just swept the box office. Yet there it is on many script coverage templates: “Marketability.” We even include it on some of our script coverage templates. Not because we’re huge fans of it in general, but because we realize that some people out there who want to avail themselves of our free templates may actually work at a production house which actually does know what they’re talking about when it comes to including budget estimates in coverage. But by and large, script readers and consultants – some of whom are vastly talented at making screenplays work, picking good stories out of a basket of bad ones, and spotting strong concepts and characters – simply are not producers or UPM’s or line producers. It’s simply flat out rare to find someone who’s a master of the two different skill sets (development and budgeting), but they do exist. And by and large, they’re the ones making the big bucks, and probably not writing coverage. So when you’re receiving a screenplay coverage from a script reader at a festival or a contest, and it includes a number for “Estimated Budget” and a figure or description for “Marketability,” the sad truth is, you’re probably not getting a super-accurate set of data. Close, sure. In some cases, maybe even spot on. But as I said, that’s rare because there are very few line producers and physical production personnel who can be bothered to write coverage. When other readers and script consultants include in their coverage reports how much a script is estimated to cost to produce, or include their thoughts on how marketable the script may be, we here at my company usually have to bite our tongue and look at our shoes in order to not say something unseemly about our esteemed colleagues, because we feel they’re flat-out selling bullpucky that doesn’t help the client in any real way. The truth is, any spec script can be made for any budget amount. It may sometimes take a bit of reworking, or it can be shot for $X as is. It all depends on the filmmakers making the film. So including our opinion of your script’s budget and marketability not only serves to potentially confuse or dishearten a screenwriter, it also runs the risk of branding her script as a high-budget, impossible-to-shoot project, when in actuality, it might actually be capable of being shot for very little, with or without a few simple script tweaks. The people in the film industry with the power to make or break spec scripts know how much your script will cost to make, low, high, and medium. They know instinctively how much you’ll sell it for, what actors will be interested, and where your film will play best. There are entire businesses, like our sister company at Film Budgeteers, or the expert site Film Specific, which are devoted to film budgeting and finance. If those types of people and places, that is, experts – provide you a script coverage budget section, or any other data, written by a script reader, that includes Marketability and Budget estimations, you can, in all probability, take those estimations to heart. Otherwise, data within those categories in a typical coverage from a typical reader or reading company is likely to have little or no true value, and any of those places featuring them as some sort of highlight or value point to their service is, in all probability, selling you a hot bag of budgetary bloviation. Or a ham from your grandma.